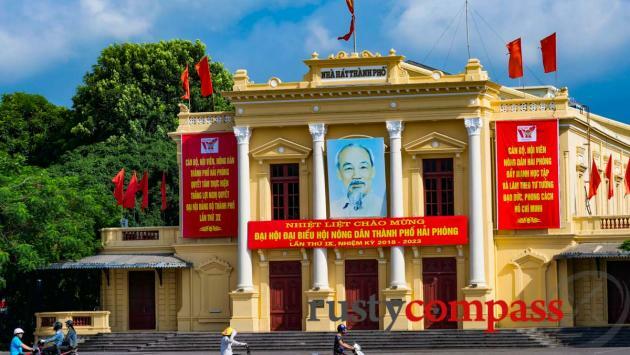 An independent travel guide to Haiphong with candid reviews and recommendations. No sponsored content, no advertorial. Haiphong, Vietnam’s third largest city and the main port of Hanoi and the north, has so far opted out of the country's two decades in the international tourism spotlight. It looks like the city has had other priorities - despite being the gateway to Cat Ba Island and Halong Bay. Since 2018, things have started to change. A new road from Hanoi places Haiphong a little over an hour away from the capital and a contest for travellers to Halong Bay is shaping up with Haiphong belatedly realising that with an airport, a rail line and a freeway, it may be the most logical staging point for travel to Vietnam's most celebrated natural wonder. For now, Haiphong is the main gateway to Cat Ba Island. You needn’t make it a priority during your Vietnam travels. But Cat Ba and the experience of Halong Bay from Haiphong are well worth considering as an alternative to the long established tourist experience of Halong Bay. 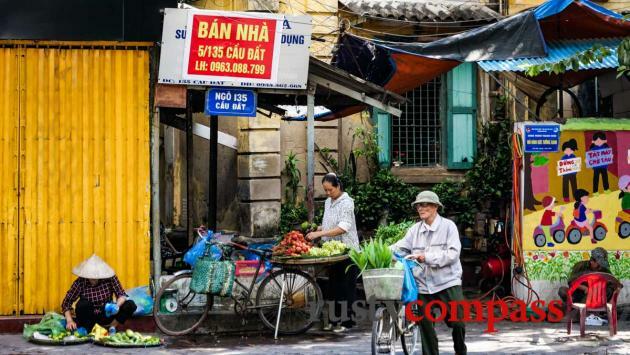 And if you have some time, an afternoon or a day exploring Haiphong, its colonial architecture, photogenic streets and distinctive cuisine can be interesting. Haiphong feels a bit like Hanoi in the 90s. The streets are more mellow than Vietnam’s other major cities. 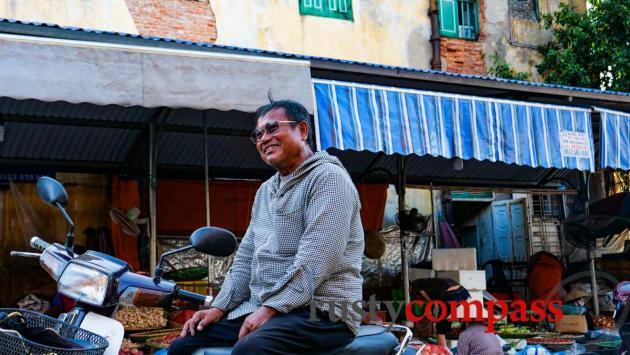 It’s second only to Hanoi for amazing, crumbling colonial era architecture, and the people still have a smile for visitors. Haiphong’s street food scene is cool too - but more laid back than Hanoi or Saigon. Haiphong is not a must-see. But if you’re interested in a major Vietnamese city minus tourists - with quite a bit of charm to boot, stop by. The airport makes it an interesting alternative for accessing Halong Bay. As a port city, Haiphong was key to the French colonial administration. The result is a large number of impressive colonial era buildings. Standout pieces of architecture include the People’s Committee complex (former Governor’s residence0 near the port, the State Bank Building, and the Opera House. There are many other major buildings attesting to the important role the port city played in the colonial economy. 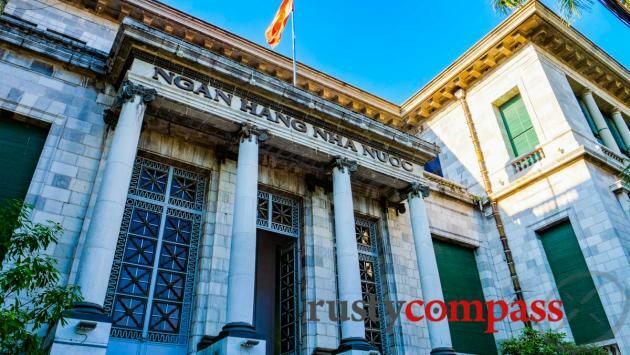 In desperate need of some love, Haiphong Museum does little justice to the city’s amazing role in Vietnamese history from ancient times to the present. It only opens 4 days a week, the upstairs collection is now closed off for 2 of those. Worth a look on account of the imposing French building it resides in. 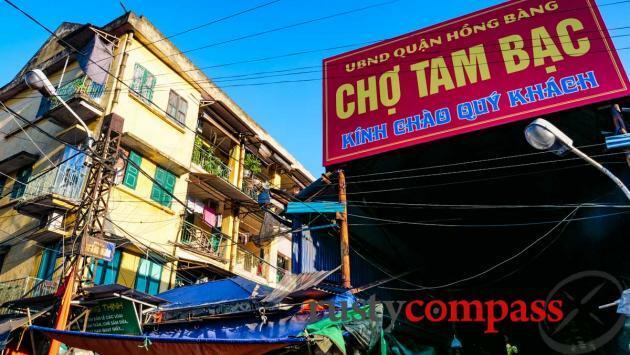 Take a wander in the streets around Cho Tam (Tam market). Very photogenic. Some great old buildings and wonderful characters. 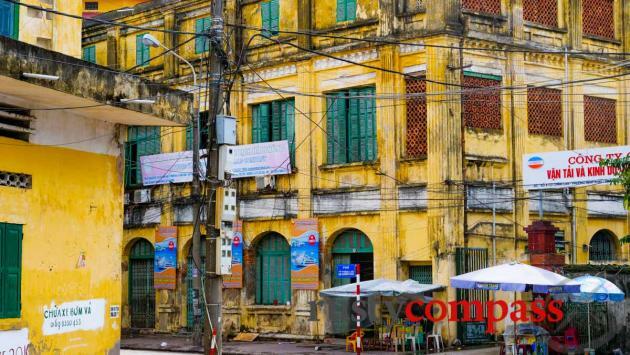 The Haiphong waterfront features some of the grandest colonial era architecture to be found anywhere in the former French colonies of Indochina. There are a number of major temples and pagodas outside of Haiphong and a couple oloser town. Du Hang Pagoda is the most famous. All of those we’ve visited are extravagant and have been comprehensively renovated - losing most of their character in the process. There is an interesting temple built into Cho Tam Bac Market. Haiphong has no real “tourist” restaurant scene. So this is a good place to eat as the locals do. Street food is everywhere. A local artist who now divides his time between Haiphong and Canada is behind Nam Giao. It’s a mix of restaurant and cafe. Nice place to chill. Friendly family run eatery serving simple local eats and familiar favourites like fried rice and noodles. My hotel didn’t include breakfast so I popped down here a couple of times. It was a good start to the day. Lovely people and a tasty banh mi trung op la - banh mi with egg and pate to get the cracking. There’s street food everywhere in Haiphong. 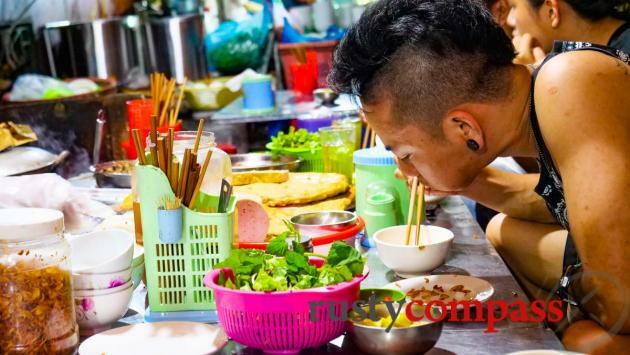 A standout strip of street eateries gets started each evening, on Dien Bien Phu St between Tran Phu and Nguyen Trai. You can get northern favourites like banh cuon and pho. 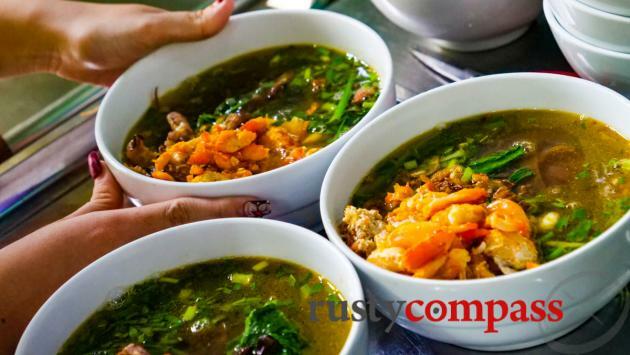 You can also get the local specialty, banh da cua Haiphong - a delicious crab noodle soup. There a loads of other options too. Everyone I asked told me Banh Da Cua Ba Cu was the best place to grab a bowl of Haiphong’s most famous culinary export - banh da cua. Turned out to be one of the least welcoming places of my trip - but the walk there was interesting. I’d just as soon eat banh da cua at any of the other more friendly streetside eateries around town. I enjoyed Ba Cu’s offering but my unsophisticated palate was unable to discern any standout qualities. The Coffee House was my regular coffee stop in Haiphong. Awesome late colonial building and reasonably good coffee. Was a good spot to get some work done too. There are Vietnamese-style coffee places everywhere. Take your pick. Haiphong’s international hotels are focused on the city’s business trade so they’re pleasant enough but low on local character. There is a Mercure and an Avani Hotel for those wanting a cookie-cutter experience international hotel experience. There are lots of well-priced local hotels around town. $25 - $50US will get you a comfortable friendly local hotel in the downtown area. 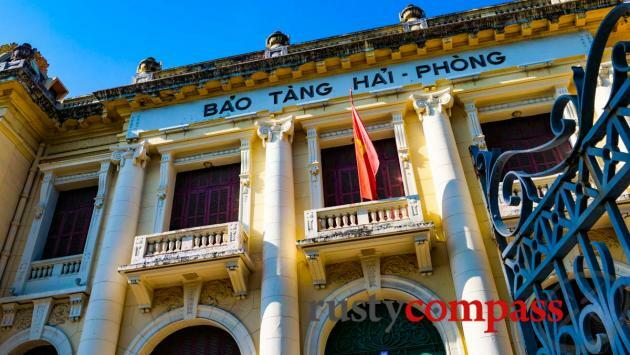 Haiphong began its days as a major French colonial port settlement in the late 19th century, but the area has been front and centre of Vietnam’s history for more than a millennia. In the Battle of Bach Dang in 938, Vietnamese general Ngo Quyen’s forces ended 1000 years of Chinese rule. The battle occurred along the river not far from Haiphong. The French designation of Haiphong as the major northern port for the colony, precipitated a building boom that is still evident around the city. Warehouses, banks, government buildings as well as opulent villas are mostly crumbling around the city today. It’s enough to give a sense of the affluence that was generated here - and mostly exported off to France. Haiphong also played a key role in Vietnam’s 30 year war of independence. In November 1946, in what is known as the Haiphong Incident or the Haiphong Massacre, the French killed as many as 6000 Vietnamese, including civilians, in their efforts to recapture the port city. So began the First Indochina War in which the French were ousted from Vietnam. America’s war followed. During the 1960s and 1970s, as a major source of military and other supplies from China and the Soviet Union, Haiphong was heavily bombed and its harbour mined. In recent decades, Haiphong’s port has been a major player in Vietnam’s rapid economic development. Some of the country’s major manufacturing takes place around the city with the output passing through the port. 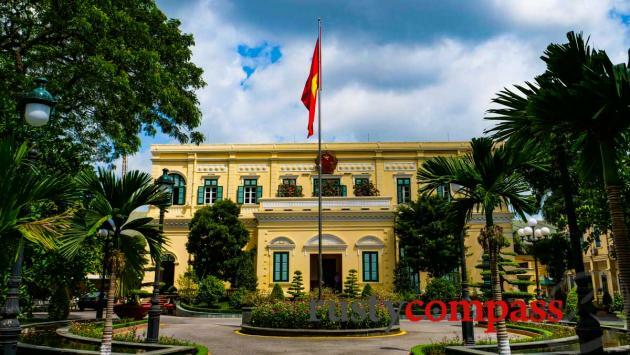 Haiphong is now poised to become a major tourism destination. In a way, as a major city, it’s remarkable how little interest the city has shown in tourism in the past. New connections to Hanoi (less tha 90 minute drive), an airport, a rail connection and overcrowding at Halong Bay’s established ports, all point to imminent change. We hope Haiphong's development as a tourism destination takes account of the city’s unique built heritage and the fragile natural assets of Cat Ba Island and Halong Bay. Haiphong may not see many tourists, but it’s one of the most easily accessed places in the country with regular air, rail links and good roads from Hanoi. Haiphong’s Cat Bi Airport is a busy domestic terminal and can be a good option for accessing Cat Ba Island (45 mins by speed boat from Haiphong town in the southern part of Halong Bay) or to head to the bay proper. There are flights from Saigon and other points. Both Vietjet, Jetstar and Vietnam Airlines operate flights on the route. The rail link (around 3 times per day, around 200K VND) from Hanoi is great for train buffs. It’s nothing flash and pretty slow (2 - 3 hours to cover 100kms). I enjoy it. The slow run across the Long Bien bridge and the Red River at the start of the journey is a highlight. 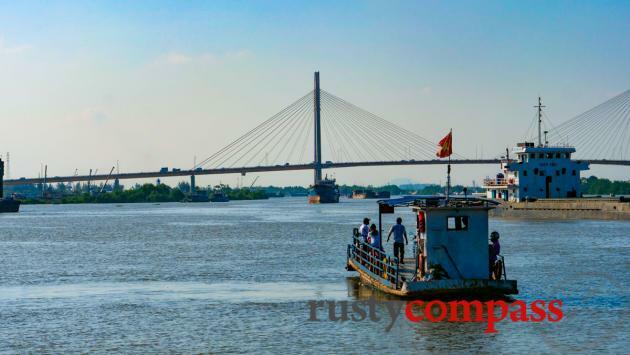 A new highway connection makes Haiphong just 1.5 hours from Hanoi. If you want to get from Hanoi to Cat Ba, check out our travel guide here. I walked everywhere in Haiphong. Took a taxi from the airport (80K VND) to my hotel and that was it. Walking’s definitely the best way to get around. Like port cities, the world over, Haiphong has a reputation for being a tad rough. I’ve never sensed it and have found the people friendly. Use common sense at night. If you need medical care, the local hospital will be fine for minor issues. For anything more serious, head back to Hanoi. All major phone carriers have good services in Haiphong and hotels, restaurants and cafes all off wifi. There are ATMs around town accepting major international cards.